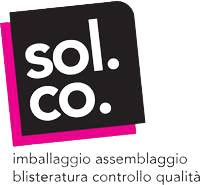 Sol.Co is a social cooperative that defines itself as a social enterprise. Through the income generate by the production activity (it deals with assembling, packaging, blister packaging, functional and qualitative control of product) it implements paths oriented to training and employing disadvantaged people. In 2014 we discovered this entity and we selected it to produce our devices. As innovative entrepreneurs, we think our objective is also to support projects that create value within the community. We are a new kind of company that wants to comply with the highest standards of purpose, accountability and transparency. We want to stand out by going beyond profit. We innovate to make a positive impact on employees, the communities in which we operate and the environment. We want our business to become a regenerative force for society and for the planet. This is how Luciana Cremonese, President of Sol.Co., summed up the concept of work carried out by the social enterprise: "for us it means giving a social role to people who sometimes do not have this opportunity": we have adopted this idea and put into practice every day inside and outside of Jonix.